It's February and it's the week that the primaries start in the US for the presidential election, omg. As it happens, both of these things are applicable for this week's Friday words. I ran across this term in an article that talks about how both sides have been moving the Overton window. 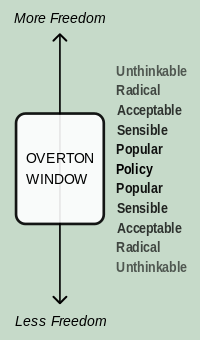 For example, the left has brought gay marriage, once unthinkable, into the Overton window. On the right, ideas like banning immigration for Muslims have become acceptable political discourse. Anyway, it's an interesting term for thinking about political science. And now February. I imagine that a lot of people know who's to blame for the names of many of our months: them Romans. January is for Janus, the two-faced god. July is modestly named for Julius (Caesar), August for Augustus. Sept-, Oct-, Nov-, and Dec- are -embers based on numbers: 7, 8, 9, and 10. One word origin that isn't surprising at all is the term leap year, which we'll enjoy again this year. Perhaps there will be terms not yet known to me that refer to February 29.